August 15th is a public holiday in both North and South Korea and signifies the date Korea became free from Japan. This date – August 15, 1945 – marks Japan’s surrender to the Allied forces and the end of World War II. In North Korea, Liberation Day is commonly known as Jogukhaebangui nal, whereas in South Korea it is called Gwangbokjeol. North Korea’s previous leader, Kim Il Sung, was heavily influenced and trained by his neighbor state, the former Soviet Union. As is indicative of a totalitarian regime, Kim Il-sung molded the North into a country that depended on him for everything. He came to be revered by his people as a god, incapable of death and intolerant of criticism. He emphasized Communist principles and ideology and “dreamed of making his country a nuclear power.” Kim Il Sung was “The Great Leader” of North Korea and “The Great Successor,” his son Kim Jong Il, boosted the nuclear and weapons programs to deter a perceived American “aggression.” When Kim Il Sung died in 1994, the reign of Kim Jong Il began and continued until his death in December 2011. And so the cycle of poverty began. “North Korea started running out of food, and as people went hungry, they didn’t have the energy to work and so output plunged even further.” North Korea’s economy spiraled downward and caused much suffering for its people. For the North Korean population taught to rely on their leaders in the Workers’ Party, they were at the mercy of their communist dictator every second of every day. NK is a Communist regime that values its state sovereignty above all else, including the welfare of its own people. Because of Kim Jong Il’s obsession to dictate over a self-reliant country that takes no abuse from outside “aggressors,” such as the United States (US) and Japan, millions of North Koreans have suffered a fate that is unable to be persuaded by Kim Jong Il’s propaganda and juche ideals: a complete break-down of human rights. Despite this behavior, NK operates under an entirely different perspective than the US, for example, and many other countries that practice some degree of democracy. In fact, “[t]he NK Government has stressed that human rights should be primarily based on the protection of national sovereignty and collective rights, and that the principle of non-interference in the internal affairs of the State should be likewise emphasized. Not surprisingly, Kim Jong Il’s Communist regime has taken a harsh outlook toward states that request it be held accountable for violations of human rights. As is characteristic of the juche philosophy and propagandist-oriented ways, the NK Government has gone so far as to state that “there was ‘a plot of propaganda fabricated and persistently pursued by hostile forces’ as part of their psychological warfare to ‘overthrow the State system of the country.’” NK persistently communicates to the world its priority of state sovereignty over anything else. BARBARA DEMICK, NOTHING TO ENVY: ORDINARY LIVES IN NORTH KOREA 66 (Spiegel & Grau 2009). 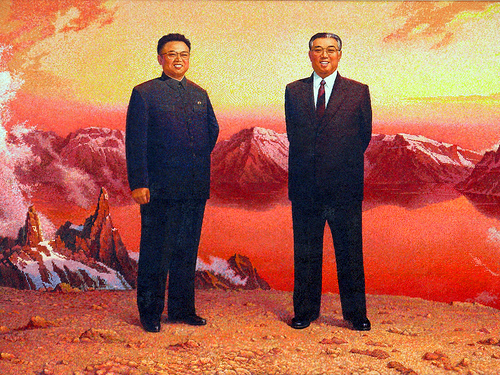 “Juche (or ‘self-reliance’) was formulated to justify Kim Il Sung’s dictatorship and succession of power to his son, Kim Jong Il, emphasizing peculiar aspects of the North Korean environment. … the ideology also serves as a tool that justifies the leader’s demand for the populace’s unquestionable loyalty. … juche ideology is the ultimate paradigm that guides State activities.” Dae-Kyu Yoon, The Constitution of North Korea: Its Changes and Implications, 27 Fordham Int’l L.J. 1289, 1291 (2004). See Morse H. Tan, A State of Rightlessness: The Egregious Case of North Korea, 80 Miss. L.J. 681 (2010). (stating that NK is a party to the following treaties: International Covenant on Civil and Political Rights(ICCPR), International Covenant on Economic, Social and Cultural rights (ICESC), Convention of the Rights of the Child (CRC), and Convention of the Elimination of All Forms of Discrimination Against Women (CEDAW)). DOS, 2009 Human Rights Report: Democratic People’s Republic of Korea, http://www.state.gov/g/drl/rls/hrrpt/2009/eap/135995.htm. In Sup Han at 131. Welcome to my blog! 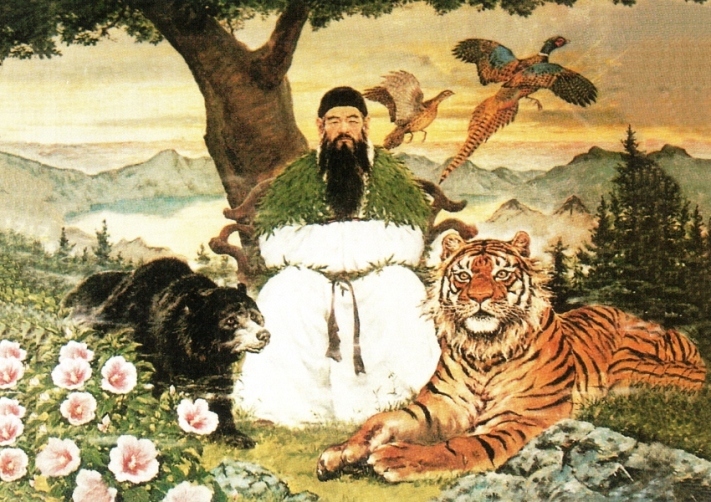 I chose the name ‘the bear and the tiger’ because if refers to the creation myth of Korea – one Korea – before the Peninsula was divided into two sovereign states, the Democratic People’s Republic of Korea (North Korea) and the Republic of Korea (South Korea). Here are some quick notes about Korea’s creation myth to help shape the rest of Korean history and subsequent conflict! Note: Any mistakes, omissions, or inaccuracies are my own and are unintended. Opinions are my own.